Kansas Secretary of State Kris Kobach outside a federal courthouse during a trial over his handling of voter registration earlier this year. Davis said he’s heard, anecdotally, that people who registered online didn’t have their registrations completed and couldn’t vote. He suspects the office may have improperly handled registrations, which is why he pursued the investigation. However, Davis said he’s not assuming the grand jury will uncover evidence of crimes and issue indictments. The call for the grand jury asks for investigation into several potential crimes, and Kobach fired back against the claims in a statement. 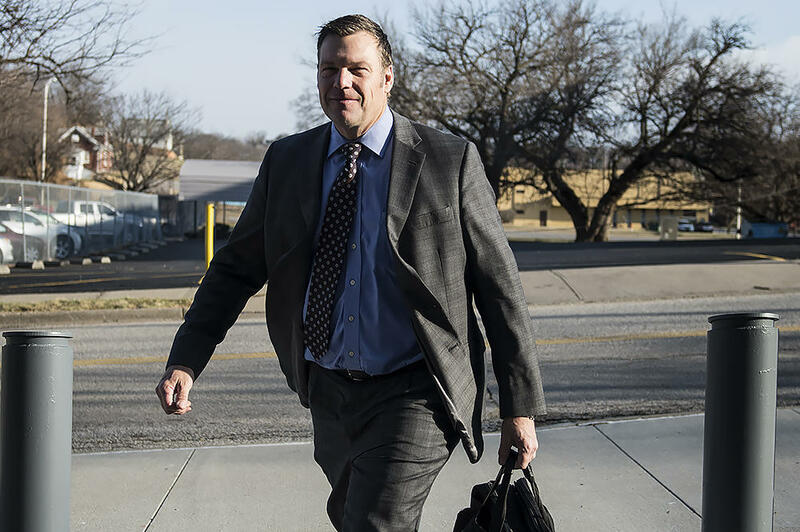 “Mr Davis's petition accuses the agency of criminally handling voter registrations, yet he presented no evidence of this,” Kobach said in the statement. “His allegations are patently false. A lower court previously denied Davis' request for a grand jury, but the appeals court overturned that decision. A website glitch prevented some Kansans from registering to vote online, Kobach said last year. Davis pointed to this to back up his suspicion of mishandled registrations. Director of Elections Bryan Caskey said the online system malfunctioned during a brief period. “The election officials at the county and state level worked quickly to correct the malfunction and to allow the affected voters to cast their votes,” he said in a statement. The Court of Appeals ruling isn’t a finding that any crimes were committed. The court only said a grand jury should be convened in Douglas County to investigate. The grand jury could start meeting in around three months, Davis said. Only a half dozen states allow citizens to call grand juries.